Hi ladies! 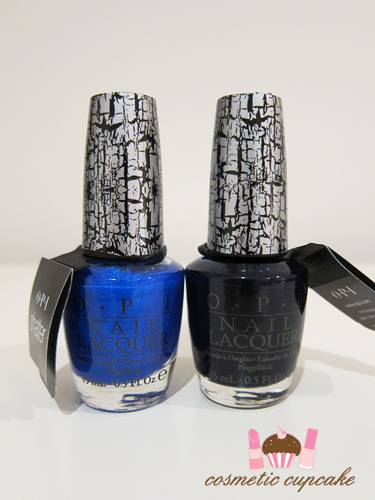 I have for you today two of the newest additions to the Shatter by OPI family - Blue and Navy Shatter. I know some of you may be over this trend, but I am DEFINITELY a huge fan of shatter/crackle so I was very excited when I was kindly sent these two to try! 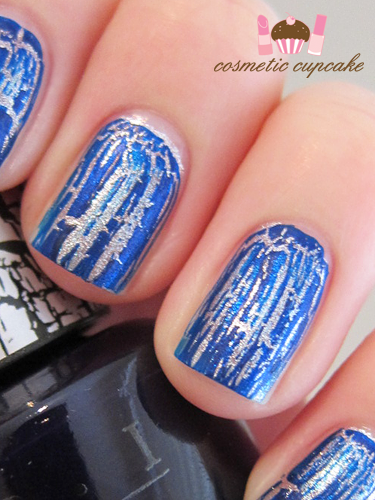 You can check out my swatches of Silver Shatter here and Black Shatter here and here also. 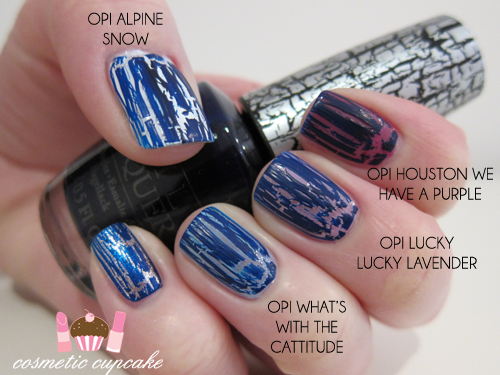 "Following on from the success of OPI's Black Shatter, OPI has released 6 new Shatter shades in white, red, blue, navy blue, turquoise and silver. The revolutionary new Shatter by OPI is a texturing treatment products that transforms as it dries on your nails. When applied over your favourite OPI lacquer shade, Shatter begins to crack and disappear, leaving behind a shattered effect in matte, within minutes of it being applied." 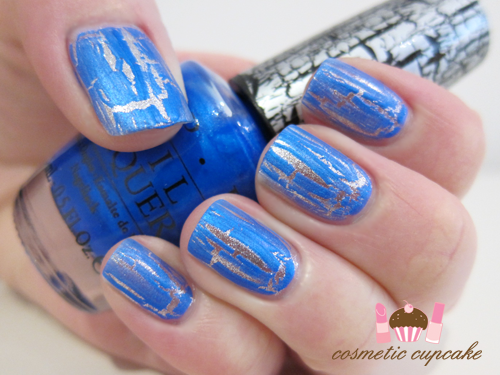 Blue Shatter is a described as a "bold royal blue shade that offers a nautical look" and I agree with the description. It's a gorgeous blue!! 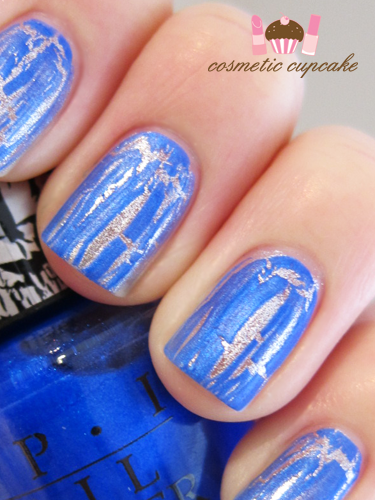 In my swatch pics, I've used one coat over a silver foil. Blue Shatter applied very easily and shattered quickly. I thought I'd try out both shatters over different base coats to see what it looked best over. I think it looks great over white or a silver base and it's not too bad over a light blue base also. The pinks just don't provide enough of a contrast for my liking. 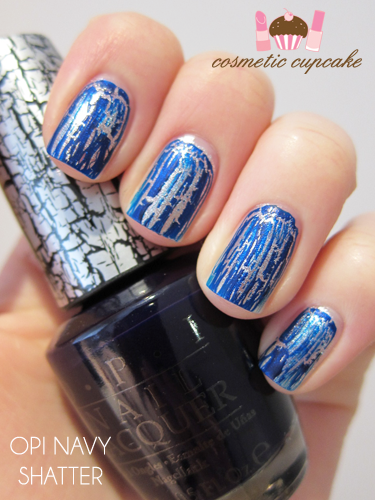 Navy Shatter is described as a "dark navy blue top coat that's similar to black shatter with a bit more of an edge". When I saw this in the bottle I was somewhat disappointed as it looked so close to black. However, once I swatched it my opinion quickly changed! You can definitely tell it's navy blue and it looks great. It's a pleasant change from all the black shatters/crackles out there! Again I've used 1 coat over a coat of silver foil. I think it's best to use Shatter over a fresh manicure as I tried Navy Shatter over a day old manicure and it didn't shatter but separated in straight lines! When I went to do proper swatches it shattered normally and it applied very easily and smoothly. Again, I've layered Navy Shatter on some different base colours to see what it looks best over. I like the white and silver foil base again as the shatter just pops! 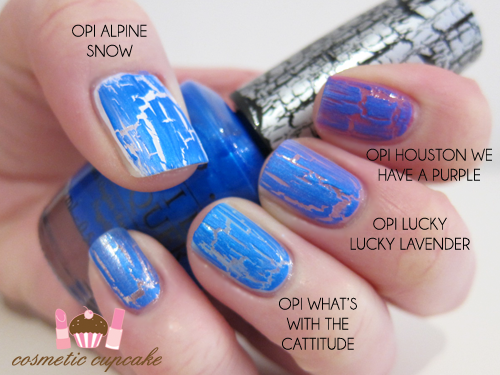 Overall: I love the Shatter by OPI collection and these latest colours do not disappoint! They are easy to apply (after that scare with Navy Shatter! ), shatter quickly and look fantastic. Shatter/crackle polishes are such an easy and quick way of doing nail art and I highly recommend them. 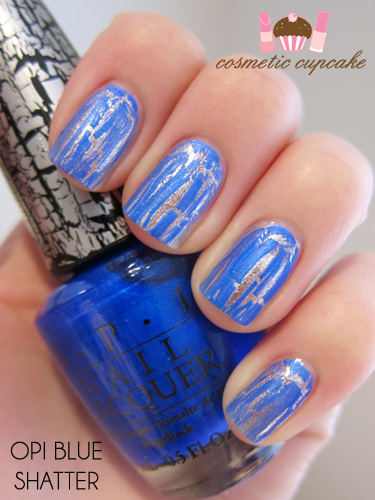 I'm always on the hunt for more blues for my polish collection and these are great! Details: Shatter by OPI retails for $19.95 and are available now at selected beauty salons and David Jones stores nationally. For your nearest OPI stockists contact 1800 358 999 or visit www.opi.net.au. Thanks for looking as always! Don't forget to enter my Apothica $50 giftcard giveaway here! Product(s) sent to me for consideration but this in no way influenced my review in any way. As always, my reviews are my 100% honest opinion. My Disclosure Policy can be viewed here. That navy does look like a nicer alternative to the blacks! i love these new versions of shattered nail polish, super pretty!! I must get the blue! lol. I was never a huge fan of the whole shatter trend because the results always looked messy or TOO haphazard. But it looks awesome on you! I love the black shatter on the blue. Totally convinced me to at give shatter a try! ´Chelle, they´re both amazing! And got beautiful on your nails! Loved it! navi one is super awesome! !